Right now, a bill that would mandate racial profiling across the state of Arizona is sitting on Governor Jan Brewer's desk, waiting to be signed or vetoed. The bill, SB 1070, is the most extreme anti-immigrant measure we've seen in years and has quickly thrust Arizona into the limelight of the immigration debate. Basically if you're brown and you live in Arizona, you'd better have proper documentation on you at all times. Left home without your wallet on accident? You might be arrested, jailed up to six months and fined. Arizona is on the verge of becoming a police state. And this is a taste of what is to come in the absence of comprehensive immigration reform. Governor Brewer has until midnight on Saturday to sign or veto the bill. If she chooses to not take action, SB 1070 will enshrine hate as the law of the land in Arizona. 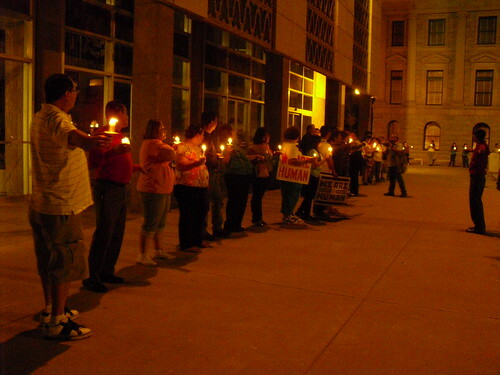 Today is the 3rd day of a continuous 24 hour vigil outside of Governor Jan Brewer's office. The community of Arizona is peacefully demanding justice and courageously standing up for what's right. Send a fax to Governor Brewer asking her to veto SB1070. If you're in Arizona, join the vigil outside of the Governor's office (map). If you are out of state, organize your own solidarity vigil (list of events here). Share on Facebook and Twitter - make this picture your profile picture and dedicate at least one status update to Arizona. If you're on twitter, sign this twitter petition! Spread the word: Talk to your friends, family and community about what's happening in Arizona. Ask them to take action too. Arizona's SB 1070 must be named as a social and racial sin, and should be denounced as such by people of faith and conscience across the nation. This is not just about Arizona, but about all of us, and about what kind of country we want to be.